In other words, if you didn't bring your "A Game" to the courts on Tuesday afternoon, you weren't going to last long. Tuesday's victors all played well and were deserving of their wins. The losers, to use a kind word, struggled. Case in point, the first matches on the Stadium and Grandstand Courts. In a first-ever meeting between two Americans with similar rankings, Wisconsin-native, Tim Smyczek, squared off with Ryan Harrison. Was a close match in the cards? Almost from the start, Harrison appeared to be troubled by an injury. Smyczek sensed it, and pounced. Smyczek took control of the match early on with two breaks in the first three games and limited Harrison to six points in the opener. Smyczek also connected on 93 percent of his first serves in the opening set to bagel the young American. "I was really happy with the way things went out there," offered up Smyczek, who coming off knee surgery is ranked No. 112 in the world. "I went out there with a really clear game plan, and frankly, that didn't change much." The second set was more of the same with Smyczek connecting on first serves and forehands, and Harrison hard pressed to win points. 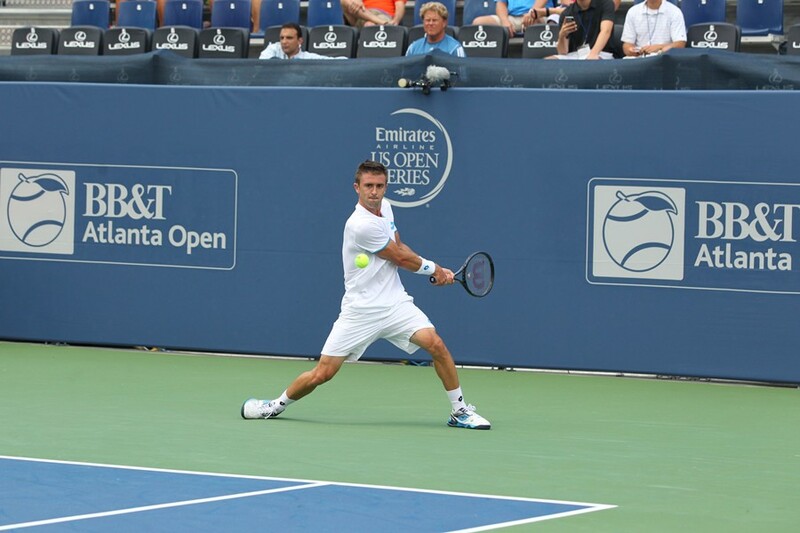 Smyczek took the second set 6-2 and sets up an interesting encounter with eighth-seed, Marinko Matosevic of Australia. "I haven't played him ever, (but) I know his game well," explained Smyczek. "He's a good player." Another dominant winner was sixth-seed Denis Istomin of Uzbekistan. Istomin, always a dangerous player who plays well against the top players, took down American, Rajeev Ram, 6-1, 6-4 in a match where Ram, a big server, was limited to two aces. Istomin on the other hand, cracked eight aces. Istomin credits his serve return for the win. "I was hitting (well) on the returns. I'm happy to get that win." Istomin also reiterated that the opening match is sometimes the hardest to play. "First match is always very difficult. Feels good to win and I have a good and open draw. I'd like to get that first title and I'd like to get it here." Also in action on Tuesday was Wimbledon gentlemen's doubles champ, Jack Sock. Sock converted on 50 percent of his break points and hit eight aces as he outclassed Alejandro Gonzalez 6-2, 6-4. Other early Tuesday winners included Thiemo de Bakker, Benjamin Becker and hometown favorite, Robby Ginepri, who came through in three sets and next faces top seed and defending champ, John Isner.